London: Could Tottenham stay at White Hart Lane one more season? White Hart Lane could live to see one more Premier League campaign in 2017/18, but decision on that is still to be taken. Should Tottenham meet their initial deadline, the club would be announcing tomorrow whether they are indeed relocating to Wembley for 2017/18. However, that deadline has been extended by a month, to April 30. Spurs assure they will make the decision as soon as there is certainty over the new stadium's construction schedule. White Hart Lane will be abandoned and demolished if one season at Wembley is considered enough to finish the new stadium. Otherwise they may opt to stay put for 2017/18 and only leave one year later. One thing certain at this point is that there is no way of staying within the Tottenham district throughout the new stadium's construction. In a statement that accompanied Tottenham’s latest financial results, club chairman Daniel Levy said: "We continue to focus on ensuring that the future of the club is protected at all times and therefore, whilst everyone is eager to know if this is our last season at White Hart Lane, we shall only make the decision to decommission our [ground] when we have greater certainty on the delivery of the new stadium. 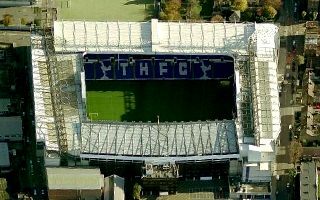 In another section of the statement, the club write that "the progress of the construction programme and the delivery timetable for the new stadium and associated public sector infrastructure works – both of which are paramount before any decision will be made on the decommissioning of White Hart Lane – are being closely monitored." In other associated news, according to The Times, HSBC, Goldman Sachs and Merrill Lynch will provide £350m, almost half of the total required, to complete the redevelopment of White Hart Lane. It is thought the club will fund the rest through advanced season ticket sales, a ten-year rental deal to host NFL games and a potential naming-rights deal worth £20m a year for 20 years.